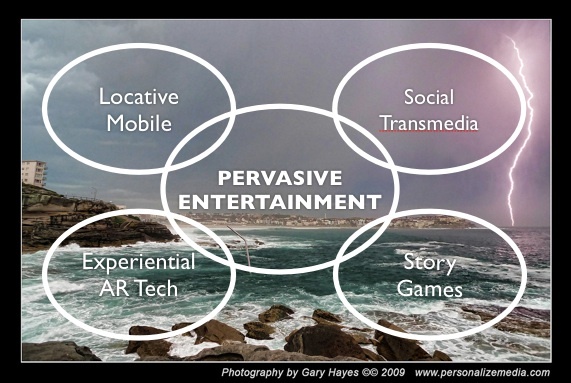 “Pervasive Entertainment – Games, Film, Physical, Print & TV merged with social networks”. It was great to see industry heads gathered at the beginning of the conference such as this State of Industry panel twitpic I took featuring the Australasian heads of Ubisoft, EAGames, Sony and Microsoft. As well as a government endorsement introduction from Brendan O’Connor, the Australian Minister for Home Affairs & Digital Culture who talked briefly about games as portable, ubiquitous & networked – yay! He also talked about the R rating for Australia on the way which is a big relief for games distributors! But my talk later was a broad brushstrokes whirlwind tour at the exiting period we are entering where the promise of ‘technology based’ pervasive entertainment for the last decade or two is getting very close. Another perfect storm as locative play intersperses with augmented reality, where socially produced media becomes embedded into real time broadcast networks and where game is truly dispersed across multiple platforms. Social media is a humbling experience much of the time. For one it is a super fast barometer of many aspects of our digital persona made up partly of a) our online influence, b) what people ‘feel’ about you (sentiment) and c) who we are connected too but more recently with the introduction of Twitter Lists we now have an element of ‘labelling’ aka ‘tagging’. Like most I am not keen on being pigeon holed, filed and rubber stamped as ‘this kind’ of person or someone who only ‘thinks/creates/is involved’ in those things, but I was fascinated this morning in doing what Laurel Papworth did some months ago, looking at how others saw me based only on my Twitter activity. the key of course is that these lists are created un-prompted by those they follow, they have selected ‘you’ quietly in the background to be a part of a personal filter, carefully structured by users who want a way to distill the vastness of a 140 character universe of noise, that is twitter – making lists for themselves of a few key personal influencers through to hundreds of sharing tweeters across several lists on quite broad topics, the lists themselves followed by thousands. There were over 6.5 million twitter lists at the start of 2010 so I suspect at least double that for 2011 according to TNW and there are hundreds of tList directories on the web now such as ListAtlas that focuses on the most popular lists such as 22 000 following the @bieberarmy :: justinfollowplease list of 91 fans who “want to be followed” by JB himself or 38 verified world leaders compiled into this list @verified :: World Leaders followed by 15 000 or so. But back to my own little world…I am not sure if the lists below represent ‘who I am’, especially as 75% of my twitter activity is sharing links, but they certainly represent areas I work in and am interested by. … without further ado – I quickly used TextWrangler to pull out key words and broke the 700 lists (I am on) into smaller ‘categorised’ batches. This serves as a one stop shop for me to dip in and out and decide which lists I will follow and for you to possibly find ones you may find of interest. What do your lists say about you? twitter.com/#!/matthanson/screen-bleed Media theories & futures in a multiplatform world. twitter.com/#!/geoffreylong/transmedia Scholars and practitioners in transmedia. twitter.com/#!/helloflow/worldoftransmedia all people you want to follow on transmedia storytelling! twitter.com/#!/ivanovitch/transmedia People working in, interested in, thinking about Transmedia. 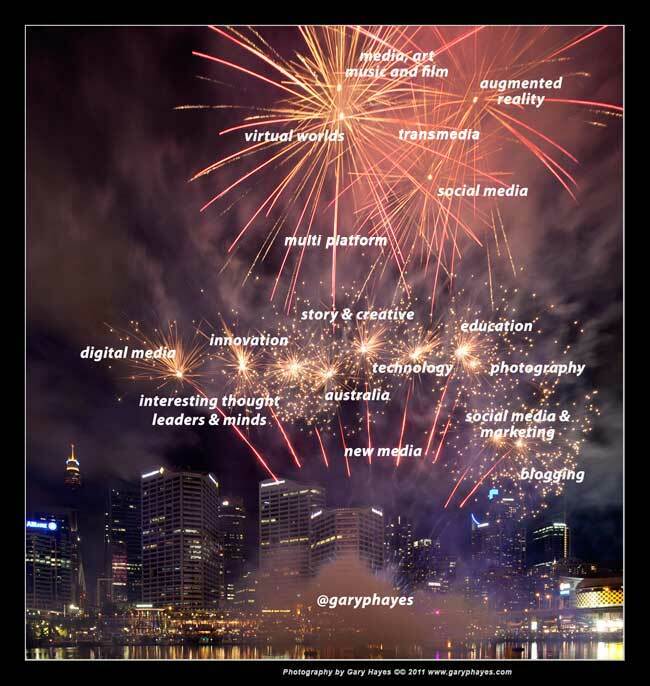 twitter.com/#!/KH_enthu_Ziasm/transmedia well, are you transmedia ready ? twitter.com/#!/melaniemcbride/gaming-transmedia-10 Makers, observers, researchers and players of games/transmedia. twitter.com/#!/nwangpr/transmedia This list follows those who are exploring new storytelling opportunities for brands and agencies. twitter.com/#!/Pixel8studio/transmedia Stories to be told. twitter.com/#!/thatgreg/new-media-2 People actively changing the way media is created and ultimately consumed. twitter.com/#!/AaronMarshall/augmented-reality Cool folks tweeting interesting things about Augmented Reality. twitter.com/#!/MikeFreyParadux/bloggers Bloggers! Check these wonderful blogs by interesting tweeps. Will the integration of Social Media into TV give the tottering Broadcast giant a well needed injection in the arm, or is it another doomed hybrid? This pretty detailed post below looks at twenty or so of the best offerings that glue TV and Social Media together – whether its live chat on the TV screen or playing a game on your laptop/mobile/games console in sync with the TV show here are most of the already existing services in this space. We have seen two key audience behaviours happen in the past 3-4 years that change the status quo – TV on one screen, social media on the other. Firstly the increased use of social media real time, communication tools (such as Twitter, SMS and Skype IM etc) means there is now a growing roar off in the distance. The viewer back channel, real time social chatter, “did you just see that”, “I don’t agree with what he just said” and most worrying for broadcasters “I’m not going to watch this again. Agree?”. RocketOn & On & On – Twitter 2.0? If RocketOn grows at its current rate it may be the follow-up to Twitter as a real time, web 3.0, animated avatar, 2D web integrated social application. It will of course need much more sophisticated friend and group management and the following/followers paradigm would work wonders here. But no doubt the company have lots on the boil along these lines? I have written for the past year or so about those half-way house virtual worlds, avatars that exist as a layer above the traditional, flat 2D web in posts here and here. Leader of the pack of these ‘parallel’ virtual worlds (I still prefer layered btw!) by some way is San Francisco based RocketOn which now has 114 000 unique active users of the service that primarily operates as a browser plug-in. CEO Steve Hoffman has told me of some key developments that will lift the service firmly out of beta. First and foremost are six major new partners that will expose RocketOn to more than 2 million potential users. RocketOn Launches Beta with Comedy.com, Hypster, Online Flash Games, Hotspot, faceDub and Boosh Magazine. Parallel Virtual World Platform Goes Live – “Imagine what it would be like if you could join a virtual world on your favorite site and interact with everyone on that site,” says Steven Hoffman, CEO of RocketOn. “And what if you could also take your same avatar to any other website and meet people there?” The result is a parallel virtual world that spans the entire Internet, where users rocket through cyberspace with their avatars and interact with virtual environments on any site they choose. 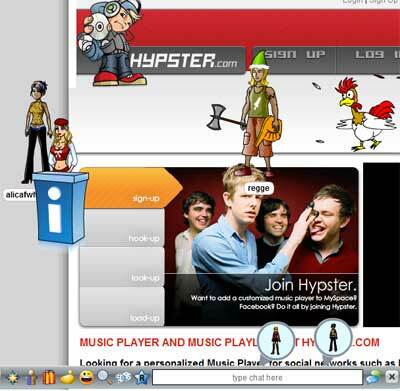 Having used RocketOn for some time on and off it reminds me of the web equivalent of the flash-mob – adhoc social gathering where you share brief experiences with others, ‘above’ web content, sometimes very compelling. 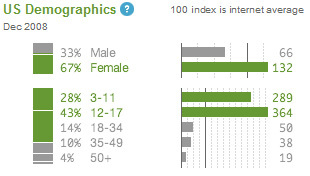 It is fascinating too that there is a strong female demographic (67% in the US) suggesting parallel worlds being seen as (and used) as social vs ‘gamey’ space. More interesting in the stats is the high proportion of 12-34 year olds – often the ages where usage of social virtual worlds tends to dip. So RocketOn is definitely feeding on the traditional Facebook and MySpace network. So the real time social element is best suited to comedy music, video and casual games where a live, real time’ness is key. Being able to call your friends together for activity and discussion around primary content in this way perhaps turns the back-channel (as in textual chatter) into the front-channel (where physicality comes into play). There is something about synchronous fun (and learning, there is a killer app hidden here for remote learning folks) over full screen video too – so RocketOn over full screen web video starts to remind me where IPTV was meant to be heading back in 2004! 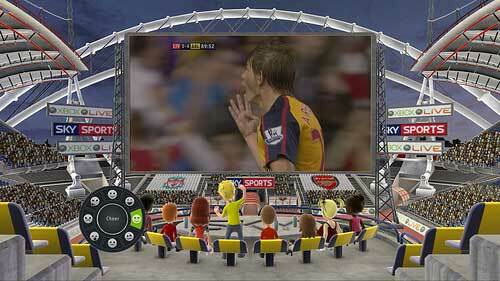 Participatory TV via the web back door anyone? SAN FRANCISCO, CA — February 2009 — RocketOn, Inc., a venture-funded startup located in South San Francisco, is rolling out its virtual world platform by embedding virtual worlds on partner sites. RocketOn’s partners range from comedy, music and game sites to community networking sites and college magazines. RocketOn has built a platform for easily embedding virtual worlds into partner sites, allowing their users to interact in real-time with one another. Every partner site is part of the overall community, and with the click of a button, users can take their avatars anywhere they like on the site. The result is a parallel virtual world that spans the entire Internet, where users rocket through cyberspace with their avatars and interact with virtual environments on any site they choose. RocketOn is announcing six partners now, with more to come in the near future. faceDub develops fun and easy software that allows users to insert their faces into any scenario. RocketOn is a venture-funded startup that is pioneering parallel virtual worlds. Its management team has worked at top game publishers, including Sega Sammy (SGAMY) and Electronic Arts (ERTS).